Is ISIS 'An Existential Threat'? U.S. air strikes since Friday have opened a corridor through which tens of thousands of Yazidis, trapped and starving on a mountain in Iraq, have escaped to safety in Kurdistan. The Kurds, whose peshmerga fighters were sent reeling by the Islamic State last week, bolstered now by the arrival of U.S. air power, recaptured two towns. But the peshmerga have apparently lost the strategically important town of Jalawla, 20 miles from Iran, the furthest east that ISIS forces have penetrated. Last week's gains by the Islamic State caused Republican hawks to flock to the Sunday talk shows. "ISIS is a direct threat to the United States of America," said Rep. Peter King, John McCain called for bombing ISIS in Syria and Iraq. But using air power to prevent ISIS from seizing the Kurdish capital of Irbil and Baghdad is not enough, said Sen. Lindsey Graham. "We need to go on offense," he told FOX News, "There is no force within the Mideast that can neutralize or contain or destroy ISIS without at least American air power." The Islamic State is "an existential threat" to our homeland, Graham added, asking, "do we really want to let America be attacked?" "If he [Obama] does not go on the offensive against ISIS, ISIL, whatever you want to call these guys, they're coming here. This is not just about Baghdad, not just about Syria. It is about our homeland." "I think of an American city in flames because of the terrorists' ability to operate in Syria and Iraq," said Graham, "Mr. President ... what is your strategy to stop these people from attacking the homeland?" This semi-hysterical talk of an "existential threat" to the "homeland," and the dread specter of "an American city in flames" is vintage war party, designed to panic us into launching a new war. But before allowing these "Cassandras" to stampede us back into the civil-sectarian Middle East wars that resulted from our previous interventions, let us inspect more closely what they are saying. If ISIS' gains are truly an "existential threat" to the republic and our cities are about to "go up in flames," why did these Republican hawks not demand that President Obama call back Congress from its five-week vacation to vote to authorize a new war on ISIS in Syria and Iraq? After all, King, McCain and Graham belong to a party that is suing the president for usurping Congressional powers. Yet, they are also demanding that Obama start bombing nations he has no authority to bomb, as ISIS has not attacked us. King, McCain and Graham want Obama to play imperial president and launch a preemptive war that their own Congress has not authorized. What kind of constitutionalists, what kind of conservatives are these? Is Graham right that an "existential threat" is at hand? Is our very existence as a nation in peril? Graham says no force in the Mideast can stop ISIL without us. Is this true? Turkey, a nation of 76 million, has the second-largest army in NATO, equipped with U.S. weapons, and an air force ISIL does not have. If President Recep Tayyip Erdogan wanted to crush ISIS, he could seal his border to foreign fighters entering Syria and send the Turkish army to assist President Bashar Assad in annihilating ISIS in Syria. The jihadists of the Islamic State may be more motivated, but they are hugely outnumbered and outgunned in the region. The Syrian government and army, Hezbollah in Lebanon, the Shia-dominated government of Iraq, a Shia Iran of 70 million, and the Kurds in Syria and Kurdistan are all anti-Islamic State and willing to fight. All are potential allies in a coalition to contain or crush ISIS, as is Vladimir Putin's Russia, if U.S. diplomacy were not frozen in the 1980s. Only last August, McCain and Graham were attacking Obama for not enforcing his "red line" by bombing Syria's army, the most successful anti-ISIL force in the field. The threat of the Islamic State should not be minimized. It would provide a breeding and training ground for terrorists to attack us and the West. But it should not be wildly exaggerated to plunge us into a new war. For wherever ISIS has won ground, it has, through atrocities and beheadings, imposition of Sharia law, and ruthless repression, alienated almost everyone, including al-Qaida. Should ISIS succeed in holding northern Syria and western Iraq, who will recognize this caliphate? Who will trade with it? How will it hold the allegiance of peoples upon whom it is even now imposing terrorist rule? 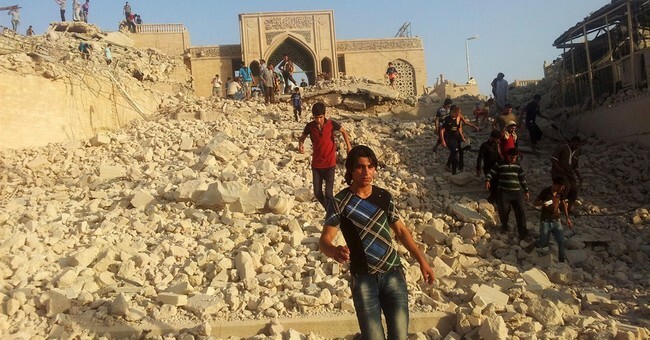 The Sunni of Iraq are already chaffing against ISIS rule. How long will Turks, Syrians, Iraqis, Kurds and Iranians tolerate a Talibanized Islamic State right next door? And should ISIS attack the United States, we have more than sufficient means to retaliate, without sending in American troops. Let Middle Easterners take the lead in fighting this newest Middle East war.